Posted on 20, June 2016 by EuropaWire PR Editors | This entry was posted in Infrastructure & Utilities, Non Profit, Transportation & Logistics, Travel, United Kingdom and tagged ABP, Historic England, Mark Frith, Port of Goole’s South Dock's 100-year-old boat hoist. Bookmark the permalink. LONDON, 20-Jun-2016 — /EuropaWire/ — The 100-year-old boat hoist standing guard over the Port of Goole’s South Dock is undergoing a £200,000 programme of refurbishment that will guarantee its future, thanks to ABP and Historic England. The Grade II* structure was built in 1912 to transfer coal coming down the inland waterways into the holds of waiting ships ready for export, but it hasn’t been used since the closure of Yorkshire’s coal mines in the 1980s. Restoration works were last undertaken in 2006 and this latest programme of restoration saw a £135,000 investment by ABP, which was match-funded by Historic England. The entire project is expected to be complete by 2019. ABP Port Manager for Hull and Goole, Mark Frith said: “We have always been mindful of the importance of the hoist to the people of Goole and of our role as custodians of the structure. 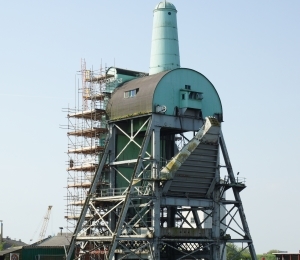 “We began discussions with Historic England in early 2015 and it was agreed that we would work together to ensure the necessary maintenance and repairs were carried out to guarantee the building’s future for the port and for the people of Goole. Historic England provided a grant of £105.5k to carry out additional work to refurbish the Tipping Ram House. The works are due to be completed over the coming weeks at combined cost of £235,500.